Did you know it is estimated that three-quarters of New Year’s resolutions are abandoned by the end of February? Why do people give up on their resolutions so quickly? It takes time to make a new habit, or to lose a less healthy one. Any new exercise regime or diet takes a while to bed in. We often set unrealistic goals and targets- for example, deciding to eat no sugar, give up carbohydrates completely or exercise every day for an hour. Knowing your current health status is a good way to start-your cholesterol level, blood sugar level, blood pressure, body mass index, and being aware of your ideal measurements . A good way to do this is to have a Health Assessment, personal to you, taking account of your age, gender, family history and lifestyle. By knowing these parameters as well as others, your individual risk for heart disease can be calculated. Other potentially serious conditions can also be screened for eg lung disease, cancers, mental health problems. This means you can set goals that really improve your personal health, which are safe and realistic for you. 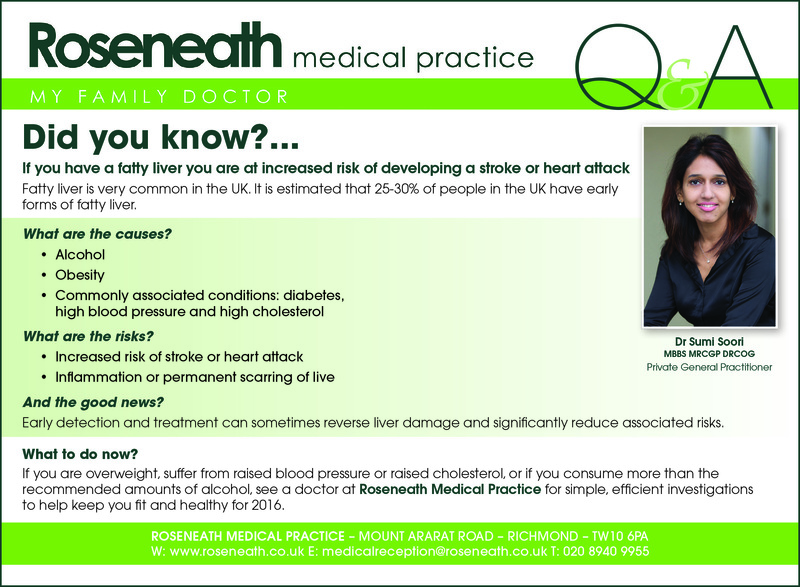 At Roseneath Medical practice, Dr Sumi Soori offers a broad range of Health Assessments- Men, Women’s, Comprehensive health assessments, Healthy heart, Cognitive assessments, Child health, Fertility, Mental health etc all with same day results. Referrals can be made as necessary to other health professionals, some on-site eg physiotherapy. Making new habits and behaviours requires us to understand our responses to stress and other triggers. Dr Soori can help you to do this through Cognitive Behavioural therapy, which can help increase your chance of sticking to you goals and achieving your resolutions. So for 2018, rather than embark on fad diets or fitness regimes that you can’t keep to, why not book a health assessment to fully understand your current health status, and receive advice and support you to successfully achieve your goals. General good health does not necessarily mean you are fertile. General good health does not necessarily mean you are fertile. Approximately 1 in 7 couples in the UK have difficulty conceiving. And the good news? Tests done through a GP can help identify a cause in approximately 80% of cases. Depending on the cause identified, a treatment plan can be formulated to help improve your chances of conceiving naturally or via assisted methods. What to do now? If you have tried to get pregnant for over one year, or if you’re a woman over 35 years of age trying to conceive for six months, or if you suspect you or your partner may have a fertility problem, see a doctor at Roseneath Medical Practice for simple efficient investigations to help assess your fertility, and help you achieve a healthy pregnancy. Risks of lack of sleep? And the good news? 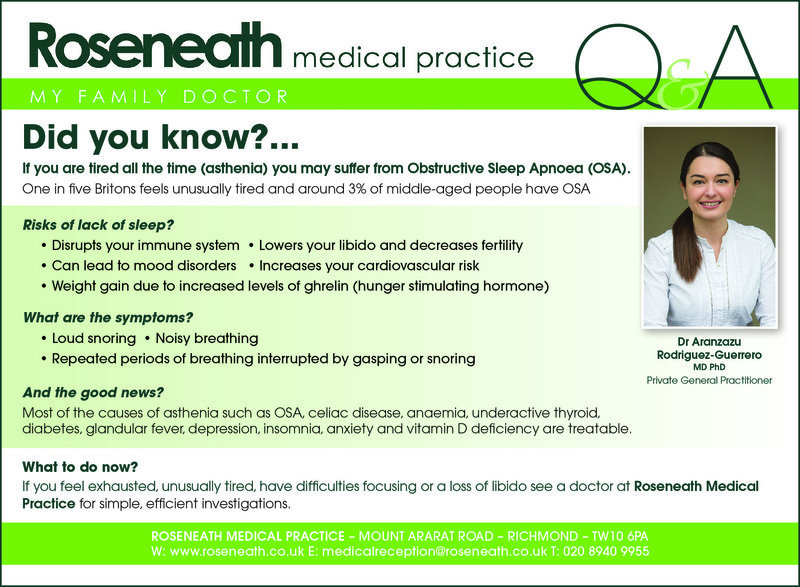 Most of the causes of asthenia such as OSA, celiac disease, anaemia, underactive thyroid, diabetes, glandular fever, depression, insomnia, anxiety and vitamin D deficiency are treatable. What to do now? If you feel exhausted, unusually tired, have difficulties focusing or a loss of libido see a doctor at Roseneath Medical Practice for simple efficient investigations and advice.